Can you believe Braxton is going to be 3 years old already?! Time has flown by and our little man has certainly come a long way! Every year, we have some very nice people who contact us via our blog or Facebook to ask for an address to send cards or gifts to Braxton on his Birthday or for Holidays. While we are very appreciative of such kindness, this year, we’d rather you do something a little different to honor Braxton on his birthday. Without further ado, here is this year’s project for Braxton’s 3rd Birthday, which is on June 24th! Braxton’s birthday theme this year is Superheroes and with that in mind, you have all just been given a Top Secret Mission. Only, it’s not so secret! We encourage you to share this far and wide to spread some kindness and tap in to your own super powers. U.R. Our Hope – U.R. Our Hope is a registered 501 (c)(3) non-profit based in Austin, TX that assists families on the journey to finding a diagnosis or helps them navigate the healthcare system with a rare diagnosis. They provide meals for families during hospitalizations, help facilitate research and medical referrals, provide gift cards to families traveling for medical appointments, and are hoping to raise money to gift Whole Exome Sequencing to families still searching for a diagnosis. U.R. Our Hope was instrumental in not only helping us find a diagnosis, but helping us connect with other families. That face-to-face support was exactly what I needed to cope and empowered me to be the mom you all admire now. I was very scared and alone at the beginning of this journey, but with the help of U.R. Our Hope I found my footing and have now helped others walk the path as well. I’ve also been honored to be a member of the board of directors for the past year. Although we have now found a diagnosis, we are forever indebted to U.R. Our Hope and hope you will consider supporting them as they have helped us. Undiagnosed: Medical Refugees – This is the documentary we were honored to be a part of this year. We were able to share our diagnostic journey with the team to help others understand why finding a diagnosis is so important. Countless families are struggling to find a diagnosis and sadly, some have lost their children without ever knowing the reason. Our journey was MUCH shorter than average and I’m so grateful for the help we’ve had along the way. This documentary would be so revolutionary and change the way medicine is practiced today. A donation to the film would go toward helping them complete the project so that the world can learn what we have experienced firsthand. Special Friends Foundation – Special Friends is also a registered 501 (c)(3) organization who serves families with Rubinstein-Taybi Syndrome, which is Braxton’s diagnosis. Special Friends provides financial assistance with medical bills, uncovered medical expenses, special therapies, augmentative communication and so much more. A donation to them would help the fellow members of our RTS family. Tinysuperheroes – This extraordinary organization provides capes for children fighting big battles. Capes are sent to children battling life threatening illnesses, lifelong disabilities, and other chronic medical conditions. Parents of children with special needs already see their children as superheroes and a cape shows the rest of the world just how strong our kids are. Braxton received his cape last year and has seen him through surgeries and doctors appointments. You can empower a Tinysuperhero for just $35! There are so many waiting to receive their cape. Sammy’s House Austin – Last, but certainly not least, is Braxton’s amazing daycare. Sammy’s House is also a registered 501 (c)(3) non-profit organization. They provide childcare services for children who are medically complex. When our daycare closed last August, I could not find a provider who would take Braxton and that I trusted with his medical care. Sammy’s was a godsend. Their director lost a child to Down Syndrome many years ago and he was the inspiration behind Sammy’s House. She, too, could not find a provider she could trust or who had enough experience to work with her medically complex child, so she started a center all on her own. Sammy’s operates entirely off of donations and serves children with a variety of disabilities. When Braxton started last August he was crawling and pulling up to stand, but had minimal cruising and no desire to walk. In 9 months, Braxton has made tremendous progress! He is walking with minimal assistance, cruising longer distances, eating by mouth, understanding language a lot more, and just overall growing every day. The staff is constantly pushing the kids to unlock their full potential and have done wonders for Braxton. A donation to this organization ensures that other kids can reach their potential as Braxton has and continues to do. We appreciate all of you for loving and supporting Braxton along this journey. 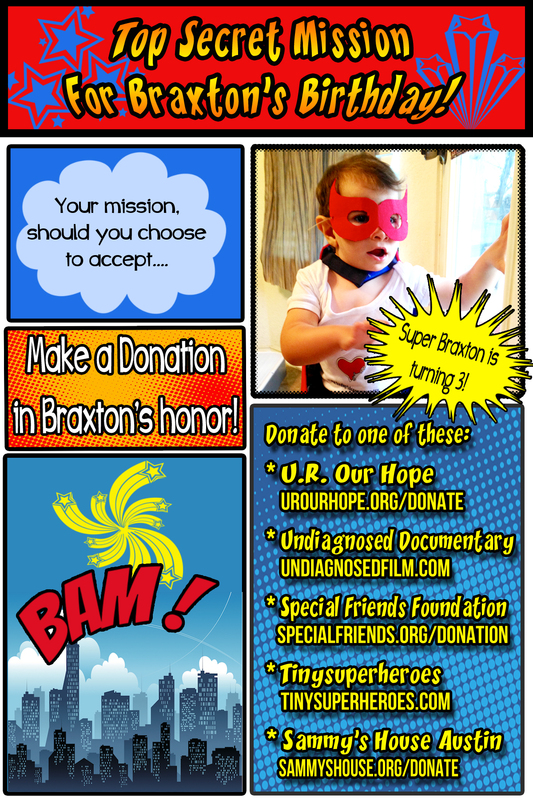 While we love the cards and gifts, Braxton already has so much and we would love to spread the generosity. These organizations have all touched our life in one way or another and it would mean the world to us if you could spare a few dollars to one, two or all of them! I don’t need proof of your kindness, but when you donate to any of the organizations, please make sure to leave a note that your donation is in honor of Braxton so that they know who sent you. We hope you will join in this mission and open your hearts!